This animation could be effectively used in classroom discussions of the broad changes in surface temperature since the late 1800s, through the present, and into the future. Works best when students watch one section of the world at a time, i.e., the Arctic first, Antarctica, then their own region of the US. 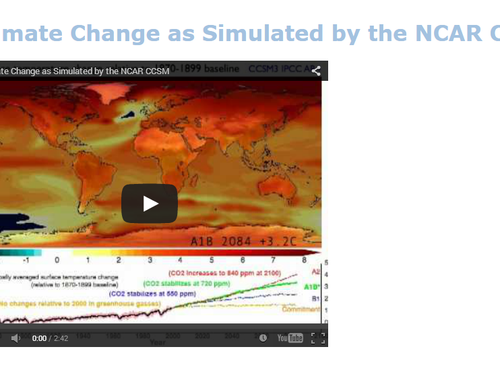 This animation is based on simulation runs from Version 3 of the National Center for Atmospheric Research (NCAR) Community Climate System Model. This version of the model does not account for deep convection in the atmosphere, or changes in tropical precipitation, albedo, or Arctic sea ice concentration. These features are included in the next generation (Version 4) of this climate model. Comments from expert scientist: It's a good summary of what one model projects for future temperature. The video is straightforward and gets the point across well. The important scientific assumptions (i.e. emissions) are explicitly pointed out. It also points out the significant cooling effect of volcanic eruptions, which is rarely shown as explicitly. There is no direct pedagogical support for this animation, although there are web links and on-video descriptions that make it clear what the video is illustrating. The layout of the animation is excellent, with the distribution of the surface temperatures on the top layer and global mean below, with appropriate labels highlighting important features of the simulation. The Quicktime version or full screen is much better resolution than the one embedded on the page.